where the constants, A1 and A2 are solved by allowing for particular values of Y0 and Y1 (initial conditions). In Figure 1 below, we have drawn the function c = 4b /(1+b )2 in (c, b ) space. It is obviously a non-linear function bounded from above by c = 1 (note that when b = 1, then c = 4/22 = 1; any other value of b will give 0 < c < 1)). 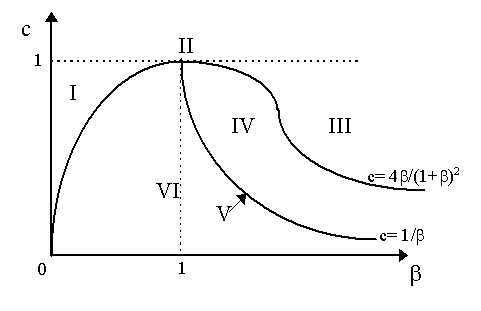 So, in the area below the curve c < 4b /(1+b )2 and we have complex dynamics (or oscillations), whereas above the curve, where c > 4b /(1+b )2 we have regular dynamics. Thus, a sufficient condition for damped monotonic stability is that b < 1. Thus, in Figure 1, we can divide the area above the curve c = 4b /(1+b )2 into two parts. In that on the left (where b < 1 in area I), we have a stable, monotonic equilibrium. In that on the right (where b > 1 in area III), we have an unstable, monotonic equilibrium. At the point where c = 1 and b = 1 (implying repeated real roots, at point II) we have a constant stationary state out of equilibrium. Obviously, we can draw the curve c = 1/b which forms the boundary between explosive and damped oscillations in the case of complex roots. This is done in Figure 1. Obviously, this is an asymptotic function which begins at c = 1 and b = 1. If c > 1/b (we are above the curve in area IV), then we have explosive oscillations. If c < 1/b , which is below the curve (in area VI), then we have damped oscillations. On the curve itself (area V), we have constant (harmonic) oscillations. How does this multiplier-accelerator reveal "cycles"? In fact, only parameter ranges (b , c) which are in situation E (constant oscillations) will yield constant cycles. All other parameter constellations will result in something else -- either complete stability or complete instability - (whether monotonic or oscillating). Thus, regular cycles are "structurally unstable" in the sense that they emerge only if there is a precise parameter constellation and any slight movement or displacement of the economy from these parameter values will end the regular cycle dynamics and enter into either explosive or damped oscillations. Thus, the Samuelson multiplier-accelerator model, as a model of the cycle, is incomplete as a theory of regular "cycles" as such, but a great advance in the theory of "macrodynamics" and fluctuations in general.